NOTE: Original Bluedio A2(Air) Series sold by" Bluedio".【FASHIONAL DESIGN】In this time headphones can not be seen as a traditional listening device, it is becoming a masterpiece in the field of Wearable. With the elements our culture, A2 Bluetooth Headphone uses a unique design to meet you pursuit of fashion and bringing future together, it presents you with a bold color palette with breakthrough design patterns. Every element of Bluedio's A2 makes a style statement that suits your life style. 【CHARGE 10 Min FOR 3 Hours MUSIC PLAY】Bluedio Air Second Generation adopts the latest Bluetooth version 4.2, and you get to enjoy the long battery life due to low power consumption. When fully charged, these headphones deliver up to 33 hours of usage on a single charge. A2's charging port is USB Type-C, which means you can charge them rapidly on the run for 10 minutes to get up to 3 hours of music listening experience. USB-C supports plugging in both sides and is future-ready. 【NICAM SOUND】Bluedio implemented NICAM optimization on A2 headphones so your music sounds full with a mellow low frequencies,rich highs with appealing vocals. 【LIGHTWEIGHT FOLDABLE DESIGN WITH CARRING CASE】Bluedio A2 lightweight body comes with durability thanks to the premium polymers used in its construction, it only weights 252g. You can enjoy your music on A2 indoors or outdoors without worrying about its ruggedness. The slide shaft can be stretched up to 8 lattice with accurate degree to satisfy different head forms. 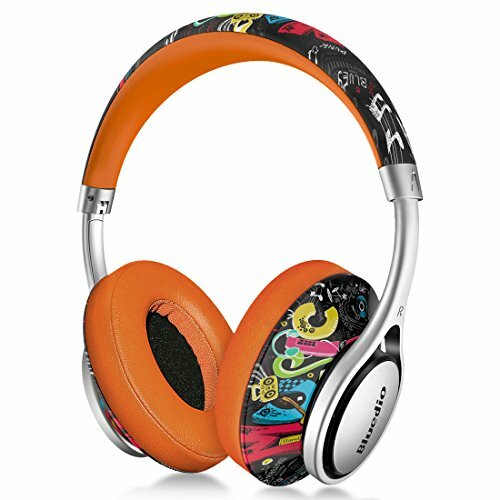 A2 headphones comes with carrying case, it is suitable for runing, hiking, travelling etc. 【WIRELESS & WIRED MODE】3 in 1 interface which supports charging and data transmitting. It can be easily plugged in both sides and convenient to use. 1. The wireless mode: Battery up to 33-hr music time in a single charge; 2. The Wired mode with 3.5mm audio cable: you can also use it as a wired headphone with the provided audio cable so the headphones will never power off. Please take off the headphone every 2-3 hrs to get your ears to relax to get better hearing enjoyment and protect the ears.